If you are a Mac user and curious to know whats going on OS market apart from MAC OS. Next Generation of OS dropped to the market by the Microsoft and its named as “WINDOWS 8“. Microsoft launched this on Last October 2012. Microsoft claims its to be fast and fun of multitasking capabilities. Most of your Friends have installed Windows 8 on their PCs and You might got lots of text dropped in your inbox says “Hey, Win 8 Awesome“, “Next Gen OS win 8, Why cant your Try out?” and more. Even i crossed such situation and I’m satisfied with my Mac OS X Mountain lion, but still i was curious about whats that Windows 8 is?. Then i installed in my Mac and Tried out. If you want to do the same, Continue with my tutorial journey. All you need a Mac Machine (Mac Book Air / Mac Book Pro / iMac / Mac Mini) and Windows 8 DVD/ ISO file which can be bought from Windows Website. First all you need to know, Your Mac OS X and Windows 8 can Install and Run Perfectly on your Mac Machine. There are two types of Installation you are going to do. I will explain you both. First method, You can Install Windows 8 and Mac OS X as Separate OS which can we select the OS while starting your Mac Machine. 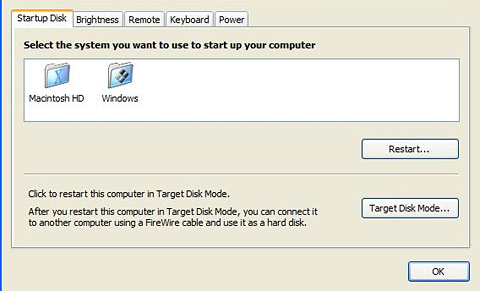 Second method, You can Install Windows 8 inside your Mac OS X as Virtual OS which don’t need restart of your mac. Just run the windows 8 in your Mac window. To Install Windows 8 as Separate OS, we need to use Boot Camp. Which allows you to use Dual boot of OS. Apple’s Boot Camp program already in your Mac OS X. 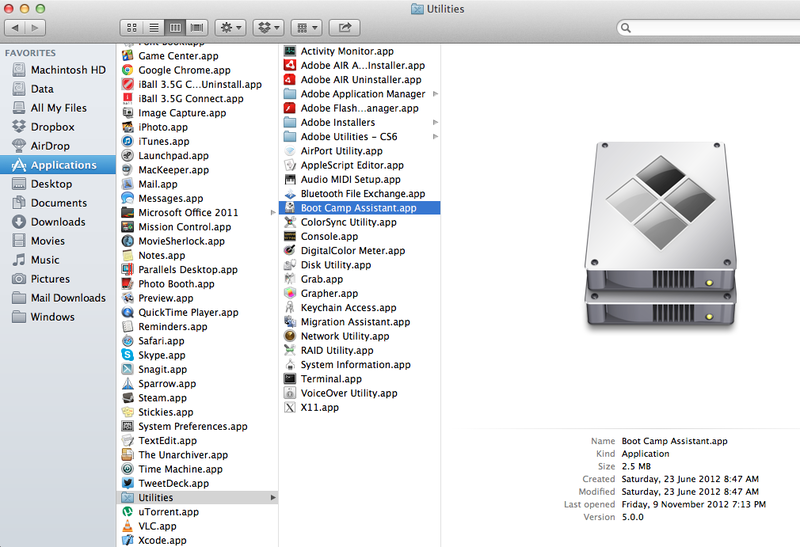 Just got to Applications in the Finder and Navigate to Utilities Folder and you can find “Boot Camp Assistant“. Note: If you have more than one partition, you cannot install windows in Boot camp. So Make sure you have only one partition which have Mac OS. If you have one or more partition, you have to install windows inside your mac as virtual OS. Insert Your Installation Disc or USB drive into your Mac and Open Boot Camp Assistant. In Boot Camp Assistant, You can choose to Install windows, download and Install support software for mac (Drivers and Boot Camp Assistance for your Windows). We recommend to download and Save it in Flash Drive. After windows Installation Install Support Software to feel the full experience of windows in your Mac. After that Boot Camp ask you to make a partition for Windows. We recommend if you are using 64-bit version of windows, then give 30 GB. It will Take you to Process of Installing windows. Your Mac Restarts and opens windows installation. 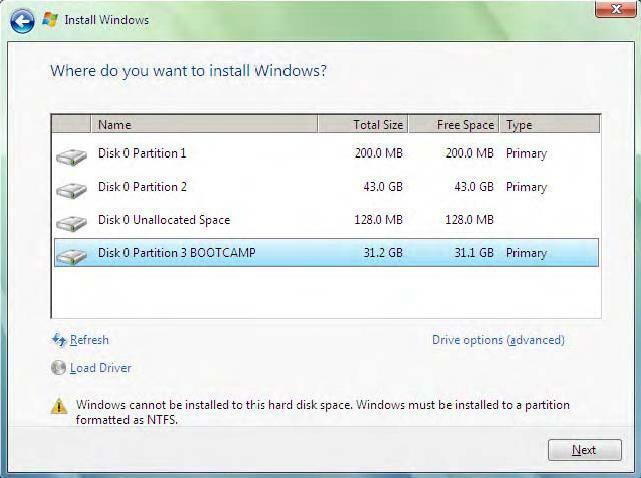 In that process, Choose Boot Camp Partition to Install Windows. This is the Screenshot of Windows 7, Same you will get in Windows 8 too. Note: if the Installation gives warning like “Windows cannot be installed to this hard disk space. Windows must be installed to a partition formatted as NTFS.”, Just Click Drive Options (advanced) and Format the Partition and install the Windows. After the Windows Installation, Install the Support Software in Windows, You will get drivers for your hardware and Boot Camp Assistant. You can Open Boot Camp Control Panel. Choose Mac OS and Click Restart. You will be restated and Mac OS will boot and Ready for you. Same like this, In your Mac OS go to Boot Camp Assistance to boot windows on the Restart. You can also install and run windows in your virtual machine using virtualization software. You can Run Windows into your Mac OS. We recommend Parallels is the best and good one to run windows in Mac. 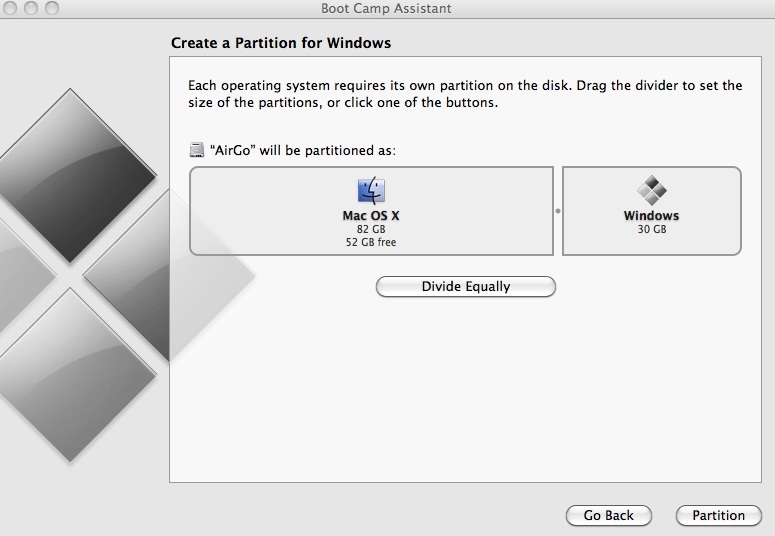 In Parallels you can import Boot Camp Partition Windows into it and you can run your Boot Camp Windows inside your Mac. 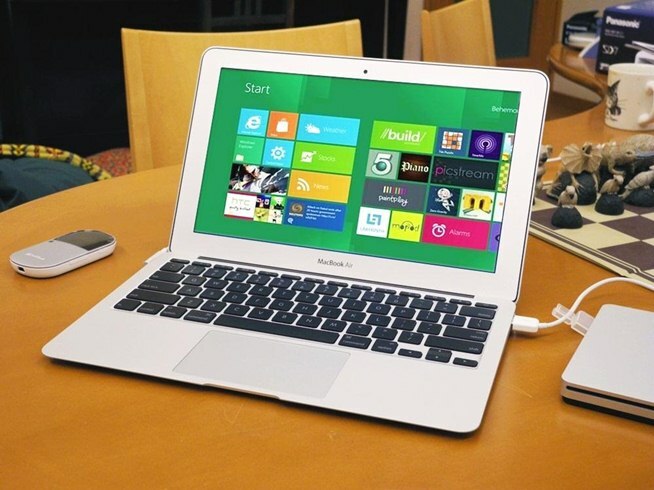 We Recommend to install Windows 8 via boot camp and Import the partition in Parallels. Now you can Run the Windows 8 separately as Dual boot and Inside Mac also. You can Get all support softwares for Boot Camp in Apple’s website. Even you can Install Windows 8 into Parallels, if you don’t have boot camp partition. If you have any queries, please drop in the Comments Section. I have installed windows 8 on mac using parallels and its not that interesting. so uninstalled it and waiting for some other method to install and experience windows 8 more. Like I don’t Show interest in windows OS, I LOVE MAC ! I definitely like your blog because I now know how to install this OS on my MAC without having any difficulties. Thanks for explaining. Now it is easy to understand for me about OS installation. I’m hoping you write ojce more soon!